You may have heard of the Venice Beach scene or the idyllic surfing in Malibu ...but that doesn't even begin to scratch the surface when it comes to the beaches of California! With almost a thousand miles of coastline, California is a paradise for swimmers, surfers and fishing enthusiasts the world over. Sure, Los Angeles usually has the lock on the Top Ten list of California beaches. But further south, there are more treasures to explore in San Diego's Coronado Beach which also traditionally appears on the list of sunny superlatives. Heading north, also don't miss Pismo Beach in central California, and Main Beach in Santa Cruz. It might also be surprising to learn that not all beaches in this surfing mecca are sandy playgrounds. The rugged and scenic California coast along many stretches features sheer rock drops to the ocean in spectacular California fashion -- with photo-ops galore for capturing nature at its most wildly beautiful. • Venice Beach is the second-largest tourist attraction in Southern California after Disneyland. 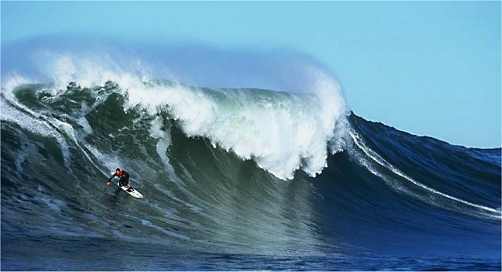 • Mavericks, an area of beach in San Mateo County, is considered one of the three best surfing locations in the world. Winter storms create waves up to 40 feet high. The Mavericks surfing contest in San Mateo county attracts the world's top surfers. • Pismo Beach is the self-proclaimed "Clam Capital of the World" and every October hosts the Pismo Beach Clam Festival complete with a clam chowder competition and a clam-themed parade. • Dana Point is one of the most beautiful beach spots along the Southern coast midway between LA and San Diego. It is named for Richard Henry Dana (1815-1882), a sailor and author famous for his novel, Two Years Before the Mast. California Beaches - See the best of the best of the Golden State's beaches - from Aliso Beach to Yountville and everything in between - with related city info, pictures, event calendar, attractions and resorts. Kid Friendly Beaches in Southern California - Check out the USA Today guide to top picks for families with toddlers. Top 10 Dog Beaches in California - Bring Fido and don't worry about getting strange looks from beachcombers - with a complete list of dog-friendly beaches from San Diego to San Francisco. San Diego Beaches - Here's the full rundown from Black Beach, to the Mission Beaches and on down to Ocean Beach with complete descriptions including lifeguard protection, rip tides, swimming, surfing and scuba diving guides, safety tips, water quality and more. Monterey Bay Beaches - This is a fun read and good, illustrated resource to northern, central and southern beach areas along with practical beach tips and local's guide.